There are two main spherical formats: Equirectangular and Cubic. Both are able to display the whole sphere that surrounds us - 360° along the horizon, 90° up and 90° down. 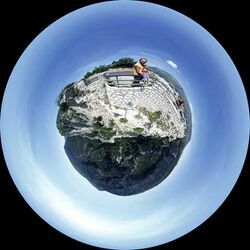 Specialized viewers are needed to view spherical panoramas. The equirectangular format is widely used by a couple of Panorama Viewers as for example PTViewer and SPi-V. It consists of a single image with an aspect ratio of 2:1 (that is, the width must be exactly twice the height). The cubic format uses 6 cube faces to fill the whole sphere around us. The image is remapped to the cubefaces which fit seamlessly. One very wide spread cubic format is QuickTime VR. It consists of one file containing the 6 faces as JPEG compressed images together with a header giving basic information how the panorama should be displayed. Another cubic format is used by SPi-V. It consists of the 6 cubefaces in a single row or column. SPi-V treats any image with an aspect ratio of exactly 6:1 as a cubic spherical panorama. This is an unusal format that remaps a full sphere such that the ground looks like if it was a little planet. See Unusual remappings for details. There is a number of possibilities to display partial panoramas - these are panoramas that don't fill the whole sphere in one or the other way. Partial panoramas can be displayed directly if they don't cover more than approximately 120° along the shorter side (that is they can be 360° in one direction but must be 120° or less in the other direction). The main formats are Cylindrical and Rectilinear, but partial spherical panoramas are possible, too. Cylindrical panoramas can show a full circle along the horizon or a part of it. They are very popular for landscape panoramas. If used for architectural subjects it might be of bother that horizontal lines (except the horizon itself) are bent. A special type of a Cylindrical Projection where the panorama is arched like on common orientation plates. See details on Unusual remappings. 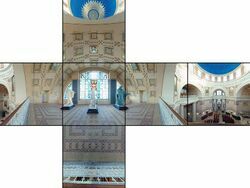 Rectilinear panoramas display the subject just like an ordinary (non-fisheye) lens would do. The horizontal and vertical field of view are limited to about 120°. Straight lines stay straight, hence they are good for architectural subjects. But if either field of view is too large they suffer from unnatural looking distortions in the corners. To partial spherical panoramas applies basically the same as to full sphericals (see above). In most cases they are used to cut off Zenith or Nadir. Vertical field of view has to be limited in this case to prevent the viewer from misinterpreting the source images. This page was last edited on 10 May 2010, at 16:34.